Of the top ten highest grossing applications in Apple’s Mac App Store, nine are made by Apple. Looks like the App Store for non-mobile was a great idea after all. Also, I predict that with the release of Lion, Apple will hold all ten, top ten grossing apps. Brilliant. 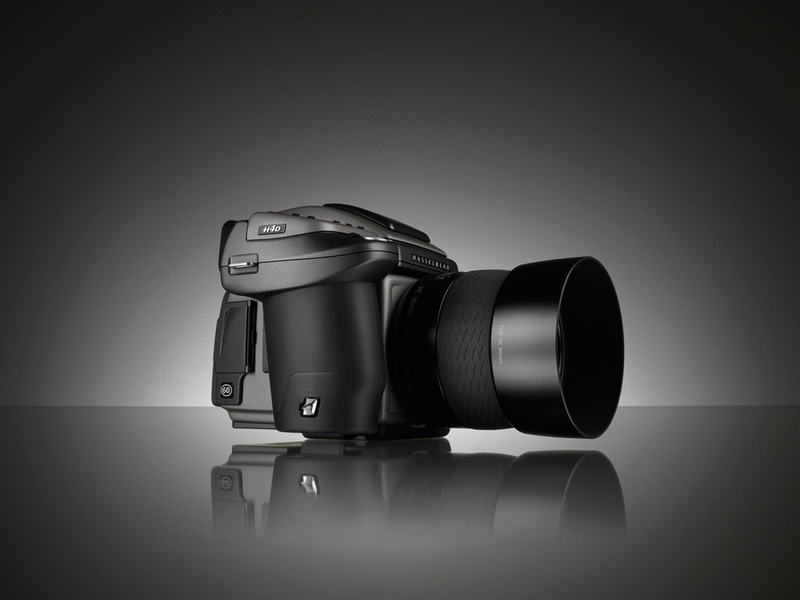 Hasselblad, the venerable digital and film, medium format cameramaker has been acquired by Swiss/German capital fund. The press release states that this will allow them to explore more markets and expand the brand. Let’s hope this means I’ll be able to buy one of their amazing cameras for somewhere under $10,000. Not that I have that sort of money for a camera but dare to dream right? It’s a lot better than paying the $30,000-40,000 they currently cost. Twelve years ago the e-commerce world was turned upside down when PayPal was founded. It was the solution to money orders, checks in the mail and the still uncomfortable credit card purchase for goods on the web. PayPal came out and Internet buyers no longer had to worry whether their credit card was going to be intercepted by some nefarious hacker and sellers didn’t have to wait for checks to clear before shipping a product. It was revolutionary for its convenience, safety and near immediate ubiquity. The 2002 purchase of PayPal by eBay seemed about as appropriate as any other acquisition, a much smarter decision than the Skype purchase in 2005. I’d wager that as much as half of eBay’s users already thought PayPal was owned by eBay, only once can I remember using another form of payment than PayPal. PayPal’s reign on e-commerce lasted over a decade and managed to make it beyond eBay into the mainstream Internet marketplace. However, the problem they were once solving was under fire from other companies like Google and Amazon with their universal logins for making purchases all over the net and Visa’s Secure Pay authorization system. Purchasing items over the Internet is no longer a risky, scary or cumbersome adventure. We do it more and more every year, much to the chagrin of state and local governments, it’s as natural as handing handing a credit card to the clerk at Target. There was a new problem on the horizon, one that has existed longer than e-commerce but seemed to have no feasible solution. The problem? How does a consumer easily, quickly and securely pay someone for a product or service in person? We’re back to cash, checks and money orders. Credit card terminals are expensive and PayPal’s solutions aren’t proving to be the panacea they once were. That’s where Square Inc. comes in. 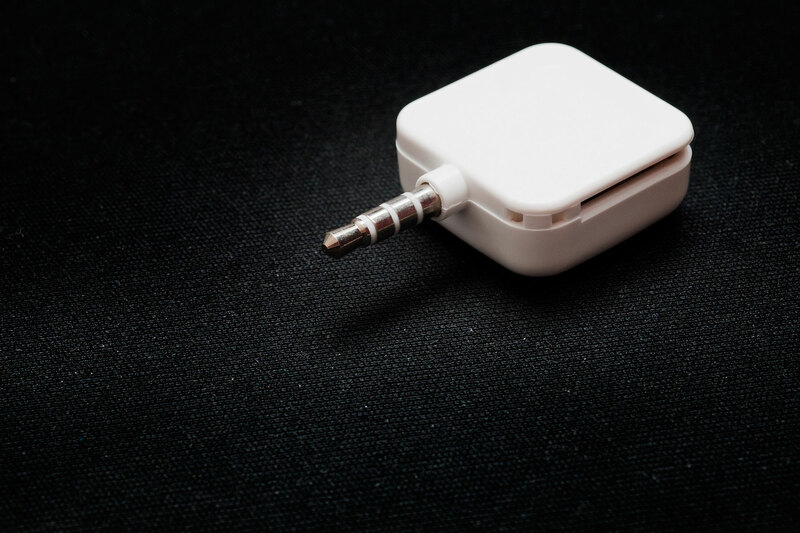 Early this year Square announced their intent to solve this problem by providing a free headphone jack dongle to iPhone/iPod Touch users to swipe credit cards. Instead of requiring both parties to be a member of the service, only the seller needs a Square account. Much like in an Apple Store, a seller is able to swipe a credit card for any amount of money, the buyer signs for it and a receipt is promptly emailed back to to both parties. The seller can even take pictures of the purchased item and include it in the digital receipt. That was quite the introduction, I know. It shouldn’t take 400 words to explain the principles behind such a tiny and simple device. Perhaps its complexity comes from its simplicity. How can something that small work and why do I need it? Shouldn’t there be a catch? Expensive iPhone attachment, monthly membership rates, minimum transactions per month or high transaction fees? If Bank of America had created this device, sure. That would be the case. Luckily they didn’t. There are no membership fees, the dongle is free, no minimum monthly transactions and affordable transaction fees. The Square dongle worked great on any iPhone/iPod Touch before expanding to the iPad, Nexus One, Motorola Droid, Motorola Droid X, HTC Droid Incredible, HTC Evo, HTC Hero, HTC Desire, Samsung Galaxy S series, and the LG Ally. When the iPhone 4 came out, with its metal exterior construction, users began reporting problems with swipes not registering and other bugs. The metal on the dongle was shorting out on the metal of the phone. Looks good, one problem: “The metal on the dongle was shorting out on the metal of the phone.” is incorrect. It’s not technically a short—works fine on the metal rim of the iPad. The problem is that the metal is an antenna and the data passing through the antenna causes interference with the dongle, causing the data to be corrupt. It took months for the original Square dongle to come out. Learning about this new problem with the iPhone 4 made many Square users wince. Luckily it didn’t take nearly as long to release the dongle as it took to create an all new dongle. It wasn’t long before Square sent out the new and improved dongles, as pictured above. The new design is thinner, smoother and sleeker. It looks more polished, swipes more reliably and maintains its price point of free. It even includes a hoop for a small lanyard (see the front right in the picture above). I haven’t had more than a dozen times that I have used my Square but I’m also not someone who sells a lot of stuff. This is huge, however, for street venders, artists, wedding photographers, garage sale people and more. No more cash only, no more prepaying and no more worry about checks clearing. It’s a solution to an age-old problem that only ingenuity, smart devices and the cloud could solve. I love my Square and tip my hat to the brilliant people who made it possible! Oh, and for what it’s worth, Square isn’t the only company in the mobile purchasing game. Intuit recently teamed up with Mophie to create the Mophie Marketplace iPhone case. Their case is much more professional in appearance, sturdier and perhaps more user-friendly. This comes at a cost however, each case will set you back $180. Intuit also charges $13 each month for access to the service, thought their transaction fees are lower than Square. Which device is the right one for you really depends on how often you will use it. I for one am happy with my Square! iPad, the First Real iPhone Killer? Today Steve Jobs and Company announced iPhone 4.0, the future operating system for their iPod Touch, iPhone and iPad devices (don’t like the iPhone moniker throw you off. While the actual announcement came as much a surprise as did the huge number of sales for the first generation of the iPad (450,000 as of today), the predictions from John Gruber were spot on. Here’s the short list. Multi-tasking, unified inbox, custom wallpapers, better enterprise data encryption, multiple Exchange accounts, background tasking (uploading photos to Flickr, running Pandora, Skype SMS/calls etc) as well as nearly 100 other major and minor improvements. I recommend reading this post from TUAW for all the details. Gruber said multi-tasking and used Pandora as his example. So did Jobs today. Gruber also predicted a unified inbox. Jobs showed that off today. But what really caught my attention, and the attention of many others I’m sure, was the Skype news. Still no Google Voice here but get this. You will soon be able to run Skype in the background, all the time. If someone calls your Skype number you simply slide to answer, just as you do now with regular calls to your iPhone. Obviously we’re all seeing how cool this can be. We’re on the same level with the possibilities here. But what about this. What if you are like me and love your iPhone and have an iPad 3G on the way. What does this 4.0 update mean for me? It means, for the first time in my iPhone life, I might dump my iPhone! Do the math. 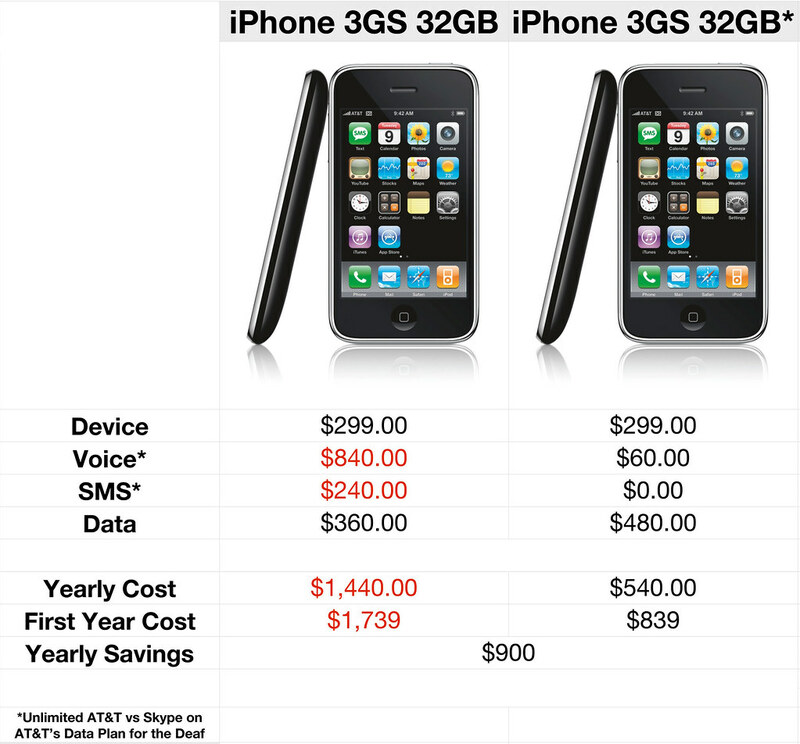 If you dump the iPhone for the iPad 32gb WiFi + 3G, you will make a saving of $590 in your first year, including the cost of the iPad! The second year, and every year after that, you save $1,020! How does this happen? Simple. 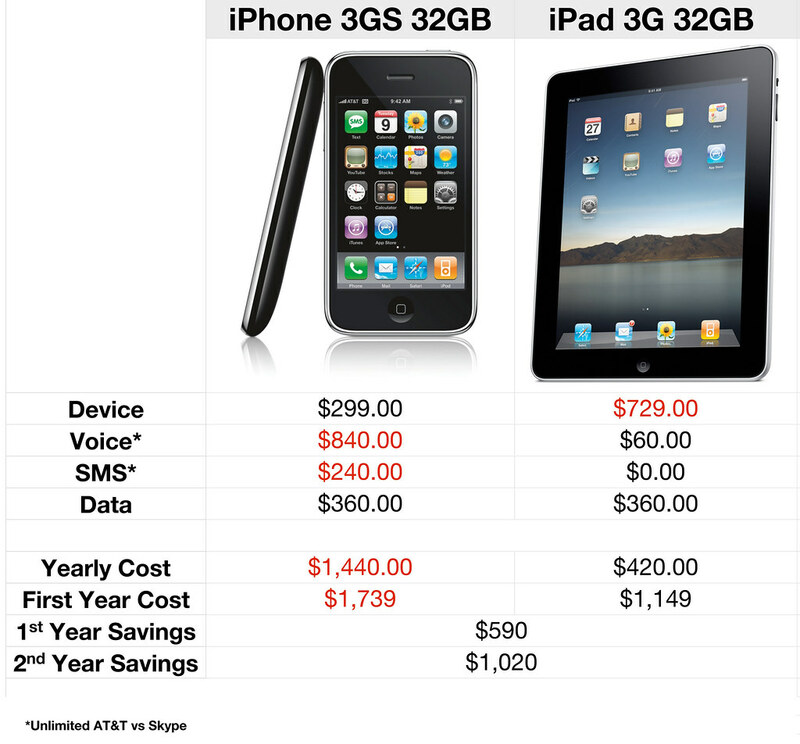 Get the iPad 32 WiFi + 3G, pay $30/m for AT&T unlimited 3G coverage, pay $30 for unlimited Skype in/out calls within Canada/USA for a year (it’s on sale right now, 15% off), pay $30 for a Skype in/out number (it’s on sale for 50% off right now from its normal $60) and you’re done. I made a handy chart that explains the savings. My good friend Ryan @rzhale pointed out how cumbersome it would be to answer phone calls on an iPad. Remember all the jokes about people carrying around iPads as a phone? Holding them up to their faces as they would an iPhone? Well get that out of your head because the iPad allows A2DP stereo, two way bluetooth. That means the stereo headsets with microphones, the bluetooth in-car systems, or simply bluetooth headsets you’re already using with your iPhone to do handsfree phone calls will seamlessly be integrated into the iPad. With Skype you will have unlimited calls within the USA and Canada (not offered on AT&T at this price) and unlimited SMS for $60 a year. That’s less than one month of access from AT&T. Will I be giving up my iPhone once this comes to my iPad in the fall? Maybe, who knows. But the possibility here is pretty awesome. I can see the iPad replacing desktop office phones while you’re at work on WiFi, a nice dock and Skype interface for that. When you head out, slide the iPad in your bag, briefcase, backpack and continue your call over 3G as you drive to lunch. As long as you are within thirty feet of your iPad, you’re good to go. For the travelling entrepreneur, you’ve just gained a new level of freedom. iPad’s 4.0 operating system will allow you to make and take calls and sms while reading email, while writing a Pages or Numbers document, or updating your Twitter status. You will no longer need your iPod, your Blackberry, your laptop. You just need your iPad. Lighter than your laptop, more powerful than your Blackberry or iPod and more functional than an iPhone. Yeah I know, there are use cases where you need a laptop but for someone like my brother, sister-in-law, mother, father and grandmother, all professionals with corporate-type jobs that travel a lot, the iPad is all they need and something they’d all love to have. Especially if it means not having to carry so many other devices on their person. Don’t forget, airlines are even thinking about charging for carry-on luggage, not just your checked bags. Spirit Airlines is the first to do this. Yet another reason to decrease all that gadget bloat. Are you excited about this prospect? Would this get you to drop your iPhone and contract? Would this get you to get an iPad now or in the fall? UPDATE: So how about this? You don’t want the iPad but still want to take advantage of some sort of savings with this iPhone OS 4.0 release. Check this out. Did you know AT&T has a Data for the Deaf plan? Unlimited data and SMS for $40/m. Now, this might not be as ethical as the above option but it is certainly an option for the penny pincher who wants all the latest gadgets! How would that break down for you? Pretty sweet actually. Here’s the chart. It’s been a while since I made a post with the explicit intent to make money from it. Years ago, when I first looked into blogging for cash I was living in California, blogging two or more times a day. I was getting a few hits here and there (a few hundred a day) and thought, why not make some money off this thing? I wrote a few articles for PPP and quite honestly… I wasn’t so pleased with the system. First off, and most importantly, I never got paid for my posts. It seems that they could not get to my entries? I provided the permalinks and was told that the offer had since expired. The posts were all for nothing. After that negative experience, I wrote PPP off and it wasn’t until this week that I looked back into them. I got an email about their entirely new system and the invitation to check it out. The new site, so called PayPerPost v4.0 is very “Web2.0” and bubbly. They’ve got Twitter integration and some nice account management. Plus, they offered me some cash to write a short review of their new service. And with that, check out PayPerPost v4.0 for yourself. In this economy (oh how I have learned to hate that phrase) we all could use a little more cash in our pockets. It just might get my seal of approval. Check back here to find out! Remember when our economy failed? Like overnight, banks just disappeared? Well, one of those banks that disappeared, though not overnight, was Washington Mutual. Now, we’ve had our ups and downs with WaMu but for the most part, they were a really standup-kinda company and I really had no complaints. Until Chase Bank purchased them. Ever since things have been hell. My payments scheduled through Bank of America, which I was told would have no trouble continuing to work as usual, stopped working. No statements were being sent to my house so I didn’t even know something was wrong. A few weeks before I found out anything was wrong, I called Chase because my cards weren’t working. They had been flagged as being stolen, all three, even though I’d only been using one for international travel accommodations. I got that sorted out, asked if anything else was screwy and they said nope. Came back to Missouri with phone calls from a collections agency! My accounts were all late by a month. One month and I’m in collections? WTF?! I paid the accounts, explained what had happened, or what I presumed had happened. They took it off my record, setup auto-pay from my checking account, all was good. Until the next week when I got an email letter/phone call that I was still over due. The last payments didn’t go through on two of the cards because she had transposed two numbers incorrectly from my Bank of America account… but only on two of the three cards. They charged me $39×4… Basically $160 for their mistake. That was refunded, they apologized, fixed it, done. Two weeks later, letter in the mail. I’m overdue, no payments for two months. I call, they say, oops, yeah that account number was written in wrong, waive the fees, apologize, setup auto-pay, get confirmation the account codes are working. Today. Get a letter, payments rejected. “Your bank states the account does not exist”. Call Chase. They see no problem, states online that I paid the amounts required and they are not sure why I’m getting charged for return payments fees of $39 and $15 on each account. Refund those charges and again state that this will never hit my credit report. Apologies, etc etc. Oops. Not so fast, payment of $210 is still pending, floating around. Their solution? Wait a month. Why? So I can get ANOTHER $39 fee on that card? Solution? As soon as these three cards are paid off, they are going into the paper shredder. Goodbye Chase Bank. You have sucked enough life out of me, and I’ve only had you as my card since February or March. Congratulations on the fastest piss-Justin-off time ever. JP Morgan The Prison Warden? So, if you really know me, you know I’ve got this horrible addiction to iTunes. My iTunes library is over 1tb and growing. Right now I’m forced to split my iTunes library over two external 1tb hard drives and my TimeMachine is already full in it’s own 1tb hard drive, and it doesn’t even backup my iTunes! In addition to my massive iTunes library, my Aperture library grows by about 10gb a month, or more. It no longer fits on my laptop and takes up half of my iMac’s hard drive space! Today my TimeMachine hard drive started giving me trouble, disconnecting itself from the computer over and over again, not good. 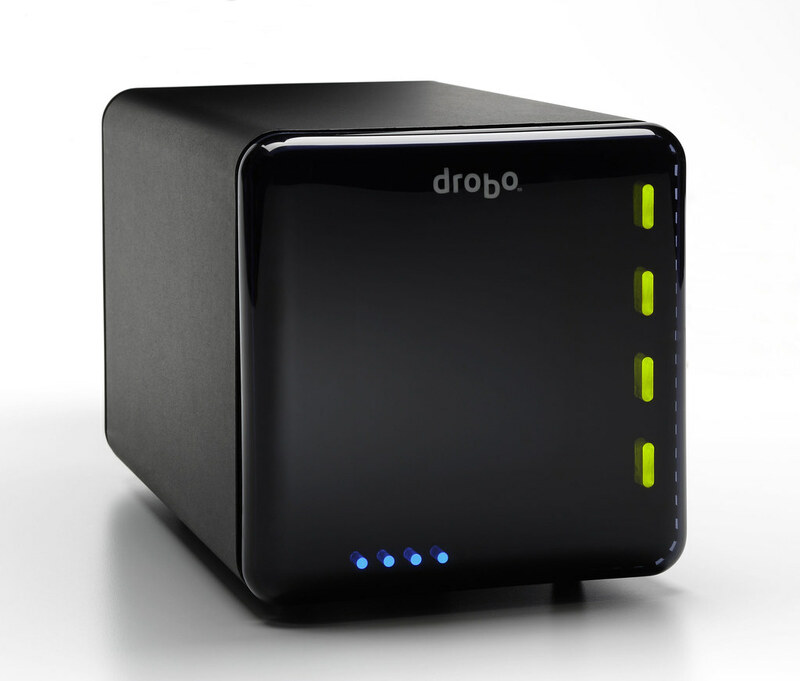 I decided months ago that I needed a Drobo, a digital robotic storage device… check it out at www.drobo.com. It’s a really incredible device, but equally as expensive. The 4tb model (which can grow to 16tb which is incredible) costs around $900. That’s a lot of money, yikes. But it’s definitely worth it. Basically a fail-proof storage device, intelligent, hot-swappable drives. It’s like RAID finally got a brain. So I’m looking at other ways of getting one, unless I start selling a ton of photos from my photoblog. @ScottBourne, from TwipPhoto, PhotoFocus, F64.com, ScottBourne.com and MyDigitalLife fame is constantly giving away 4tb Drobo drives, I even know someone, through twitter, who has won one! UPDATE: As of today, June 20 2009, Scott Bourne has cost me even more money! I forgot to mention the Epson Stylus Photo R280 he recommended in addition to the Panasonic Lumix DMC-LX3 I ordered on his recommendation and the Drobo I so badly wanted here with the four 1.5tb drives!